He transferred to the army reserves and studied martial arts. He trained kick boxing under under Kurt Bond and kick-boxing and Preying Mantis Kung fu under 1979 Hong Kong Light Weight Champion, Al Cheng. For several years, Doug competed in Canada and in the 1982 Hong Kong full-contact martial arts tournament. As an army reserves infantry sergeant, Doug served as a United Nations peacekeeper in Croatia, (former Yugoslavia) in 1993. On returning to Canada, he moved to Winnipeg and taught fitness, martial arts and self-defence to hundreds of people, including seniors, school children and welfare investigators. While attending the University of Manitoba (at age 39), Doug continued to train in martial arts under Brazilian Jujitsu instructor and former professional cyclist, Michael Fuentespina, unarmed combat instructor Rick Volpato and Choy Lee Fut sifu Neil Mc Ritchie. At age 40, he re-entered the kick-boxing ring and won a welter weight championship in Manitoba. (His younger opponent, who had a 6-0 record, “threw in the towel” after the fourth round.) At age 47, Doug climbed Mt. Rainier. 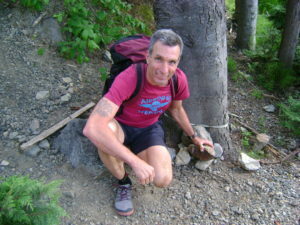 After moving to Vancouver, Doug continued to train clients, run boot camps and wrote books, including Strength Endurance Secrets: Building An Unstoppable 2nd Wind, Stomach Flattening, Reduce Your Alcohol Craving, Simple Secrets to Handle Your Alcohol Better: Student’s Edition and One Less Victim: a crime prevention manual. • Dropped 50 pounds (and a bad relationship) and took up skiing and found the love of her life. • Knocked out two Muay Thai fighters at a martial arts tournament. • Turned back the clock, snored less and gained more interest from their spouse. • Qualified for police training. • Felt younger and walked faster, even in the snow. • Stopped taking pain medicine and started wearing a size 3 again.